Tranexamic acid (TXA) is an antifibrinolytic agent that is commonly used in cardiac, gynecologic, and obstetric surgeries. Inadvertent intrathecal injection of the TXA may lead to serious side effects, including back pain, myoclonus, seizure, and ventricular fibrillation that can be attributed to similar appearance of ampoules, location of ampoules, and incorrect labeling of prefilled syringes and can be avoided by vigilance, correct labeling of syringes and ampoules, double checking medications prior to administration, and preventing manufacturing of vials of different drugs with similar appearance. Treatment of intrathecal injection of the TXA includes administration of the anticonvulsants, general anaesthetics, MgSO4, along with intensive haemodynamic monitoring, scalp electroencephalography monitoring guided burst suppression with thiopentone infusion and cerebrospinal fluid lavage. Objective: To determine the effect of intraoperative factors while using technique of anaesthesia and use of specific opioids on patients' pain score and need for first rescue analgesia in the post-anaesthesia care unit (PACU) after caesarean section (CS). Patients and Methods: This is a cross-sectional study on CS patients with 6 months collected data that include patients' demographics, surgical incision, duration of surgery, technique of anaesthesia, intraoperative use of specific opioids/co-analgesia, numerical rating score (NRS) and time of first rescue analgesia in the PACU. Results: Among 334 patients enrolled in the study, 7.2–13.3% had NRS >4 and required first rescue analgesia within the first hour in the PACU with 28 (8.4%) patients at time zero and 20 (6.0%) patients at 30 min in the PACU. There was no statistically significant difference among patients having NRS >4 from those having ≤4 in terms of the type of incision, American Society of Anaesthesiologist grading and duration of surgery. A statistically significant (P-value < 0.01) low pain scores in the initial 30 min in the PACU was observed in patients having surgery under regional anaesthesia (RA) compared to general anaesthesia (GA) and in patients receiving intraoperative intravenous (IV) morphine compared to nalbuphine or tramadol when operated under GA. Conclusion: The need for rescue analgesia during the initial 30 min in the PACU was less in patients undergoing CS under RA or receiving IV morphine under GA.
Background and Aim: Epidural analgesia (EA) offers an effective form of labour analgesia. The time of administration of EA and its relationship with the mode of delivery is controversial. Our study tried to assess whether early initiation of epidural analgesia influences the obstetric outcome in nulliparous women. Materials and Methods: This was a case control, randomised study which included 60 parturients in spontaneous labour divided into two equal groups, the cases and controls. Cases received EA with 10 mL of 0.125% injection bupivacaine, whereas the control group received a systemic opioid (injection pethidine 100 mg intramuscularly) for pain relief. Cases were further divided into parturients receiving EA at a cervical dilatation of 3 cm or less classified as the early epidural group and those receiving EA at 4 cm or more classified as the late epidural group. The modes of delivery for the study population were recorded. Data analysis was done using Wilcoxon two-sample test. P < 0.05 was considered statistically significant. 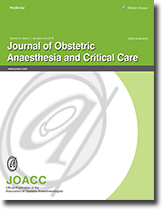 Results: The rate of instrumental vaginal delivery between the early epidural group [95% confidence interval (CI) 0.358–10.821; P = 0.43] and late epidural group (95% CI 0.150–6.055; P = 0.96) was not significantly different. The cesarean-delivery rate was also not significantly different between those receiving early EA (P = 0.95) and late EA (P = 0.58) when compared with control group. Conclusion: This study showed no significant difference in the incidence of caesarean or instrumental delivery for women receiving early epidural analgesia when compared with late epidurals or no EA. Background: Hypotension is a well-known side effect of spinal anaesthesia in obstetrics patients undergoing caesarean section. This is likely to affect both mother and fetal well-being. 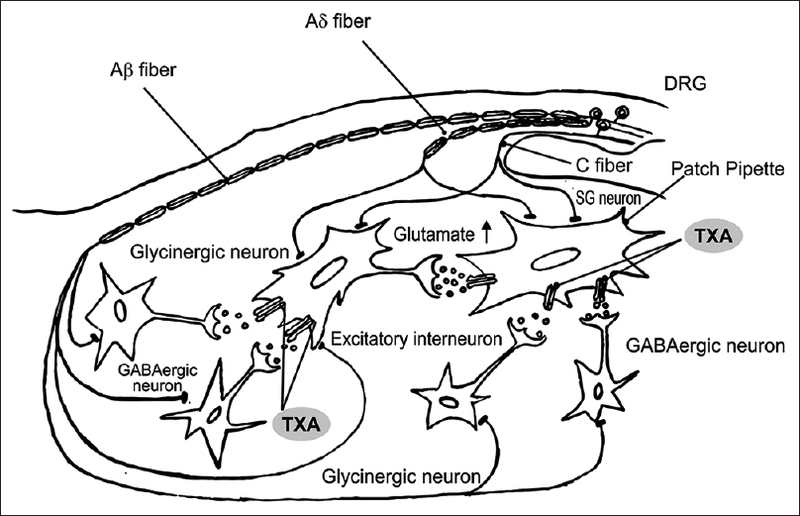 Systemic haemodynamics are modulated by autonomic nervous system (ANS). Evaluation of ANS may be helpful in predicting hypotension. The present study is designed to identify the subset of pregnant patients at higher risk of developing post-spinal hypotension based on baseline heart rate (HR) prior to administration of anaesthesia. Materials and Methods: This was a prospective study conducted on 100 patients aged 20–30 years, of American Society of Anaesthesiologists (ASA) grade I or II, scheduled for elective caesarean section under spinal anaesthesia. Patients were divided into two groups based on their baseline HR. Incidence of hypotension and ephedrine requirement following spinal anaesthesia were noted. Results: Thirty nine patients out of 100 developed hypotension (39%), of whom 27 were in the group with HR >91 beats per minute (bpm) (50.9%) and 12 patients were in the group with HR <90 bpm (25.5%). The incidence of hypotension was statistically significant between two groups (P = 0.0260). The use of ephedrine was greater in group with HR >91 bpm than group with HR <90 bpm (mean 3.9 ± 0.45 vs 4.34 ± 0.45, P = 0.0148) and it was statistically significant. 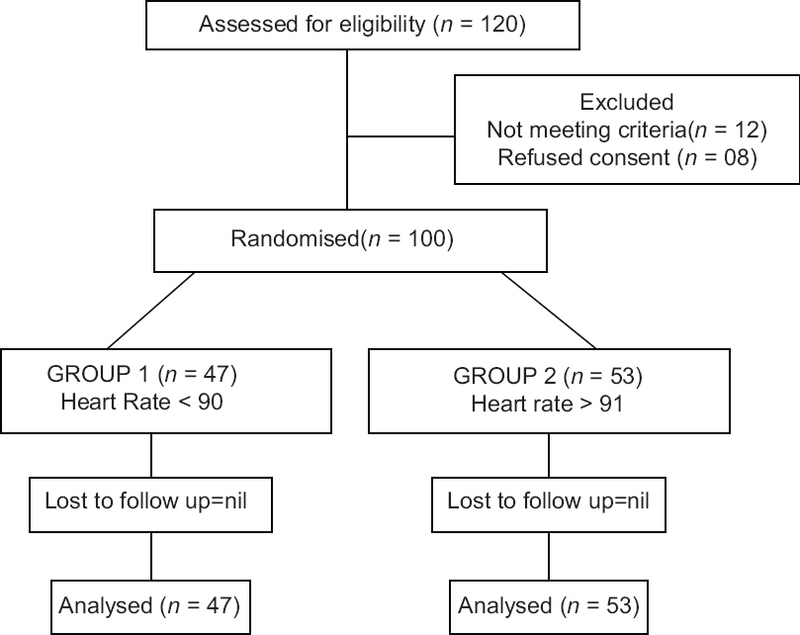 Conclusion: Pre-operative baseline HR may be used to predict risk of post-spinal hypotension in obstetric patients undergoing caesarean section. Background: Dural puncture epidural (DPE) is a method in which a dural hole is created prior to epidural injection. This study was planned to evaluate whether dural puncture improves onset and duration of labor analgesia when compared to conventional epidural technique. Methods and Materials: Sixty term primigravida parturients of ASA grade I and II were randomly assigned to two groups of 30 each (Group E for conventional epidural and Group DE for dural puncture epidural). In group E, epidural space was identified and 18-gauge multi-orifice catheter was threaded 5 cm into the epidural space. In group DE, dura was punctured using the combines spinal epidural (CSE) spinal needle and epidural catheter threaded as in group E followed by 10 ml of injection of Ropivacaine (0.2%) with 20 mcg of Fentanyl (2 mcg/ml) in fractions of 2.5 ml. Later, Ropivacaine 10 ml was given as a top-up on patient request. Onset, visual analouge scale (VAS), sensory and motor block, haemodynamic variables, duration of analgesia of initial dose were noted along with mode of delivery and the neonatal outcome. 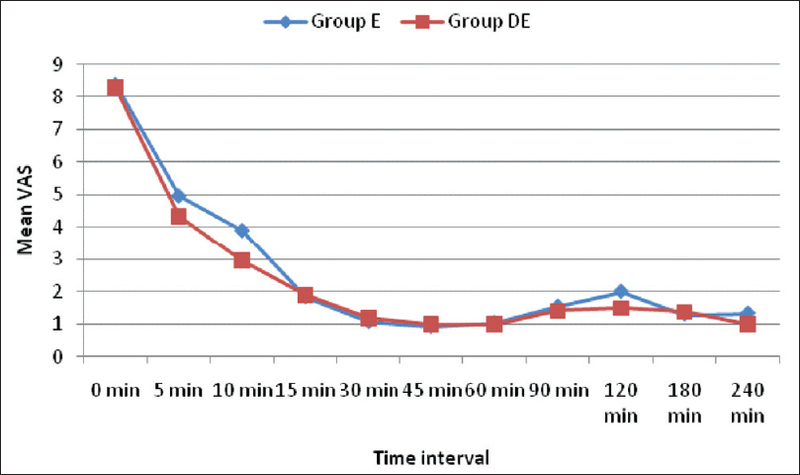 Results: Six parturients in group DE achieved adequate analgesia in 5 minutes while none of those in group E (P < 0.05) achieved adequate analgesia. 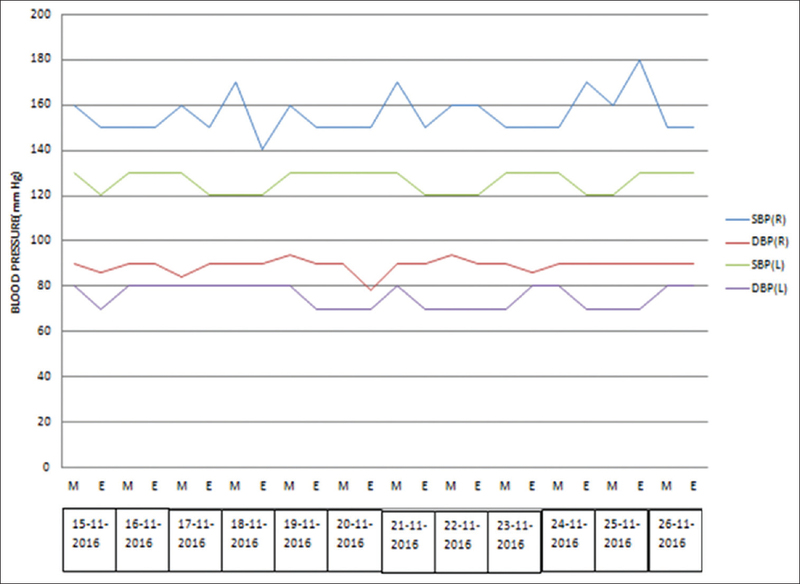 The mean VAS score was 4.97 ± 0.85 in group E and 4.33 ± 0.922 in group DE at 5 min (P < 0.05). 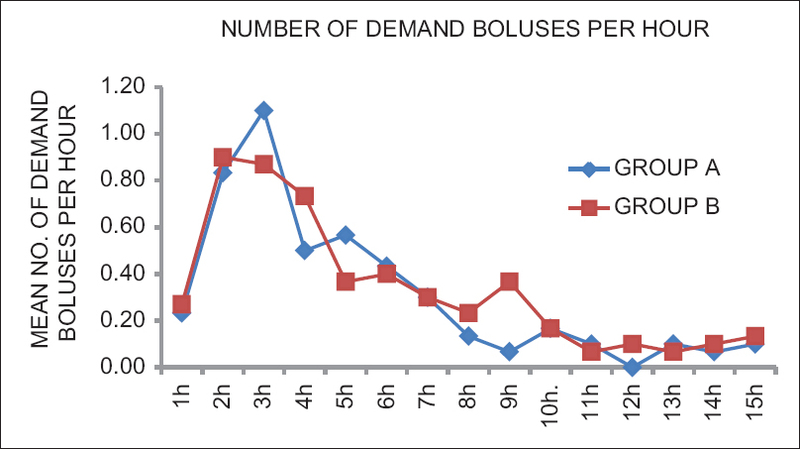 Duration of analgesia of initial bolus dose was 99.37 ± 23.175 min in group E and 98.77 ± 24.955 min in group DE (P > 0.05). Conclusions: Both techniques of labor analgesia are efficacious; dural puncture epidural has the potential to fasten onset and improve quality of labor analgesia when compared with conventional epidural technique. Introduction: Spinal anaesthesia is the preferred technique for caesarean section. Around 80% of which is complicated by maternal hypotension. Vasopressors are currently the treatment of choice for spinal-induced hypotension but these may individually have significant maternal or foetal side effects. Aim: To compare ephedrine and phenylephrine infusion with ephedrine and phenylephrine combination for preventing the hypotension in patients undergoing emergency caesarean section under spinal anaesthesia. Materials and Methods: A prospective randomized double blind study of 90 parturients beyond 32 weeks of pregnancy for caesarean section under spinal anaesthesia. Assuming a potency ratio of 80:1 ephedrine to phenylephrine, the patients were divided into the following three groups: Group E - received infusions of ephedrine 8 mg/ml, Group P - received infusions of 100 mcg/ml phenylephrine and Group E + P received infusion of ephedrine 4 mg/ml + phenylephrine 50 mcg/ml. A predefined algorithm was used to adjust the infusion rate according to the systolic blood pressure (SBP). After spinal injection, SBP, diastolic blood pressures (DBP), heart rate (HR) were recorded every one minute until the cord was clamped. Also, the vasopressor infusion rates were collected till clamping of umbilical cord in each group. 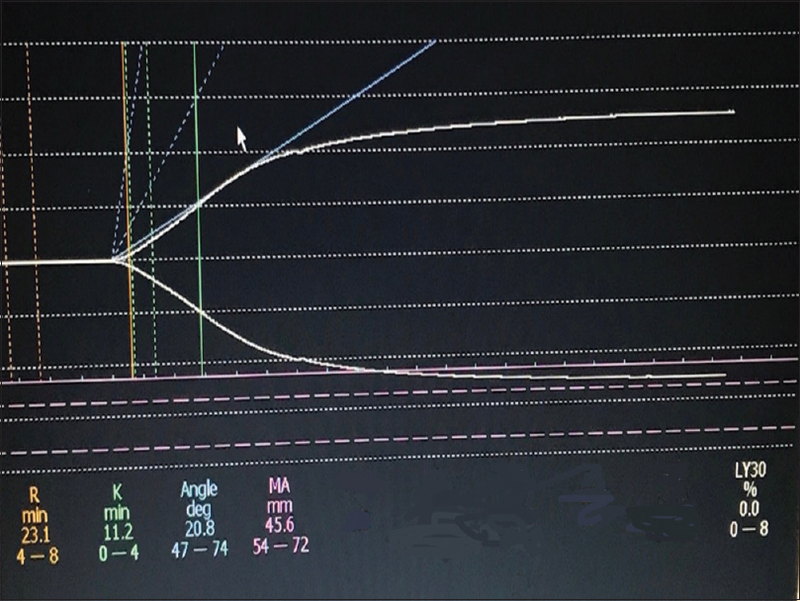 Foetal parameters were analyzed from umbilical blood gas. Results: The incidence of hypotension was significantly higher in ephedrine group. The mean rate of infusion was higher for group E (P < 0.05). The foetal metabolism measured by mean pH, was significantly higher in group P(P > 0.05) as compared to others. Complications of bradycardia were observed in 30% of patients receiving phenylephrine. Conclusions: Combination of both phenylephrine and ephedrine is efficacious for spinal-induced hypotension with least maternal or foetal side effects. Background and Aims: Lumbar epidural analgesia is considered the modality of choice for labour analgesia. Despite its super analgesia and improved safety profile, it has been associated with maternal adverse effects like higher incidence of instrumental assisted vaginal delivery (AVD) and motor block leading to decreased ambulation. This study was designed to evaluate the efficacy of low concentrations of local anaesthetics (0.1% ropivacaine and 0.1% levobupivacaine) with 2 μg/ml fentanyl as a patient controlled epidural analgesia (PCEA) technique on the incidence of instrumental AVD along with evaluation of obstetric, maternal, and foetal outcomes. Materials and Methods: In this prospective study, 60 labouring parturients were randomly allocated into two equal groups to receive either 0.1% ropivacaine with 2 μg/ml fentanyl or 0.1% levobupivacaine with 2 μg/ml fentanyl as epidural solutions via PCEA pump infusions (4 ml/h) after 15 ml loading dose of the respective solutions. The incidence of instrumental AVD was noted as the primary outcome along with demographic data, maternal and foetal vital parameters, maternal VAS scores, degree of motor blockade and total epidural drug consumption. Results: The incidence of instrumental AVD was found to be 43.3% in the levobupivacaine group and 30% in the ropivacaine group. This difference was not statistically significant. Both the groups were comparable in terms of demographic data, maternal VAS scores, total epidural drug consumption and foetal APGAR scores. Conclusion: The use of newer local anaesthetics (levobupivacaine and ropivacaine) in low concentrations with opioids (fentanyl) as a PCEA technique may offer high maternal satisfaction in terms of quality of pain relief with fewer adverse events like instrumental AVD and adverse foetal outcomes. Aortic stenosis (AS) in young women is often the result of a congenital bicuspid aortic valve, occurring in 1–2% of the population. Although the anaesthetic management of parturients with AS remains controversial, the high rate of caesarean delivery is consistent among studies. A 30-year-old primi gravida with severe AS presented for elective caesarean section at 36 weeks gestation (twins). She had a failed balloon valvuloplasty 15 years ago and declined further intervention. Prior to induction, invasive lines and prophylactic extracorporeal membrane oxygenation cannulas were placed. A modified rapid sequence intubation technique with propofol/remifentanil target-controlled infusion and suxamethonium was performed. Anaesthesia was maintained using total intravenous anaesthesia. Both twins were delivered uneventfully and oxytocin infusion was commenced. Gradual desaturation to 95% occurred intraoperatively and a focused lung ultrasound and transthoracic echocardiogram were performed. Intravenous frusemide 20 mg was administered empirically. 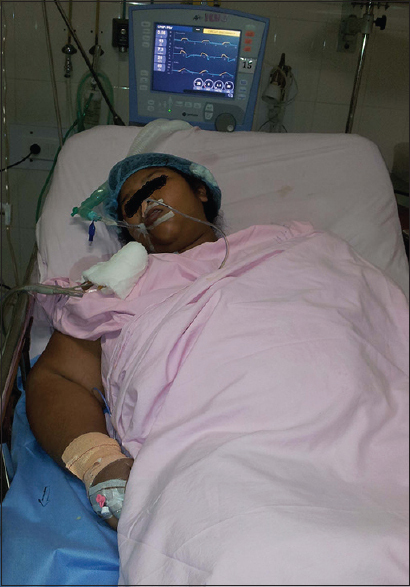 Post-operatively, the patient was extubated and transferred to the Intensive Care Unit for monitoring.Severe AS is associated with high risk of maternal morbidity and mortality. In our case, due to the twin gestation, cardiac output and metabolic demands rise exponentially leading to increased risks. A multidisciplinary approach with appropriate monitoring and point-of-care testing are key to such complex cases to achieve favourable maternal and foetal outcomes. Obstetric hemorrhage is a leading cause of maternal mortality and morbidity. Uterine atony is the major cause of postpartum hemorrhage (PPH) accounting for 79% of all cases besides genital trauma, placental causes and coagulation disorders. We present a case of massive obstetric hemorrhage secondary to uterine atony that was referred to our center in a state of hemorrhagic shock with severe metabolic acidosis, hypothermia and coagulopathy. Prompt activation of massive transfusion protocol, use of thromboelastography guided correction of coagulopathy and early hysterectomy to control hemorrhage played a vital role in successful patient management. Postoperative intensive management of ventilatory function, haemodynamics, kidney function and sepsis led to a favourable outcome. This case highlights the importance of multi-disciplinary team management involving anesthesiologist, emergency medical personnel, obstetrician, blood transfusion services and critical care team in optimizing the clinical condition of the critical patient. Increasing numbers of congenital heart disease patients are now surviving to child bearing age. This complex patient cohort present a great challenge to the obstetric anaesthetist and multidisciplinary teams. This report describes a rare case of a patient undergoing emergency caesarean section at 31 weeks gestation due to decompensated critical congenital aortic stenosis. The physiological effects of pregnancy in patients with aortic stenosis are discussed along with principles of managing anaesthesia for caesarean section in the presence of this cardiac lesion. Perioperative management of parturients with congenital heart disease is a challenge for the anaesthesiologist. The choice of anaesthetic technique plays an important role in determining the postoperative outcome of such patients. We report a 35 weeks primigravida diagnosed with coarctation of aorta in early pregnancy. She had normal antenatal course but at 35 weeks she presented with uncontrolled upper limb hypertension. She was planned for early elective caesarean section in view of presence of imment HELLP syndrome. Here, we discuss the anaesthetic challenges and their perioperative management leading to favourable outcome of the patient. We present a 32-year-old G1P0 woman at 32 weeks and two days gestation with new onset paraplegia, hyperreflexia, and sensory disturbance that gradually progressed over the past month and acutely worsened over the last 24 hours. MRI revealed a demyelinating process of the thoracic spine and diffuse cervicothoracic cord oedema. After 7 days, her foetus developed recurrent heart rate decelerations and an emergent caesarean section was performed. On airway exam, she was Mallampati 3 with a short thyromental distance. She reported fasting overnight and into the morning. Our choice was between performing neuraxial anaesthesia in the setting of an acute demyelinating process of her spinal cord versus general anaesthesia on a patient at risk of aspiration with a potentially difficult airway. Given the potential complications of neuraxial anaesthesia, we utilized rocuronium to perform a rapid sequence induction of general anaesthesia with endotracheal intubation.